In an effort to better understand why fruit flies are immediately attracted to our food, a team of scientists developed a device, called Flywalk, to measure the response of insects to odor signals. Researchers discovered males and females of the same species were attracted to different odors and that their brain function, when determining between “good” and “bad” odors, resembled that of a mammalian brain. In collaboration with colleagues from Portugal and Spain, researchers at the Max Planck Institute for Chemical Ecology in Jena, Germany, have developed an apparatus that automatically applies odors to an airstream, while filming and analyzing the behavior of insects simultaneously. The system is called Flywalk and consists of glass tubes, airstream regulators, and a video camera. The reactions of 15 flies to up to eight different odorant signals can be tested at the same time. A first series of tests have revealed that male and female fruit flies respond differently to attractant substances. Male flies are no longer attracted to females that already mated with another male because a deterrent odor (cis-vaccenyl acetate) that surrounds these females. Two further publications report on the processing of odor signals in the insect brain. Flywalk can exactly measure the responses of insects to odor signals. If insects run upwind, i.e. against the direction of the airstream, the odor is rated as attractive; if they stop or run downwind, the odor is deterrent. The system allows the use of not only single odorants but also odor mixtures. In addition, odor pulses of varying length and concentration can be given. The high throughput and the long automated measurement periods − the insects can stay in the Flywalk tubes for up to eight hours − facilitate the statistical analysis of the results. Experiments with fruit flies demonstrated that females − in contrast to males − are more attracted by typical food odors, such as ethyl acetate. This behavior seems to reflect the search for the best oviposition place in order to make sure that the larval offspring will find sufficient food after hatching. The response to deterrent odors, such as benzaldehyde, is identical in both males and females. Males, on the other hand, respond positively to the odor of unmated females: If the odor surrounding virgin females was introduced into the Flywalk tubes, the males moved upwind. “This way, we demonstrated for the first time that females, as observed in other insect species, attract their mates with odors. The chemistry of these odorant substances is currently being analyzed,” says Kathrin Steck, who carried out the experiments. The substance that renders mated females unattractive to males willing to mate is already known: cis-vaccenyl acetate. With this odor a male “marks” the female during copulation. Thus a male fruit fly prevents further fertilization by other males and makes sure that his genes are spread. In their study, the scientists measured the activity of so-called projection neurons in the brains of fruit flies. These are located in the antennal lobe, the olfactory center of flies. 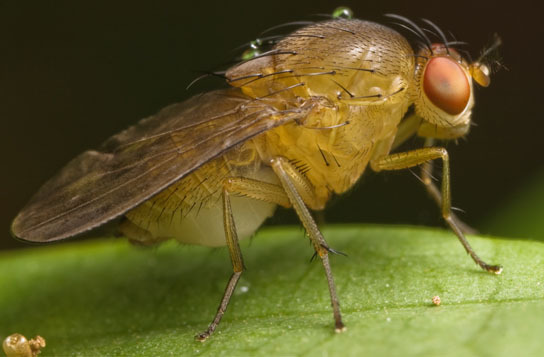 Experiments performed with six highly attractive and six highly deterrent odors revealed that attractive and deterrent odors are processed in specific brain regions of the flies as has already been shown in mice and humans. “The function of an insect brain thus resembles that of a mammalian brain more than previously thought,” the researchers write. Because the activity of projection neurons already reflects a kind of “interpretation” of incoming odorant signals, the assessments “good” or “bad” which ultimately regulate the flies’ behavior seem to be represented early in the insects’ brains. Activity measurements in the antennal lobes of Lepidopteran species Spodoptera littoralis (Egyptian cotton leafworm) and Spodoptera exigua (beet armyworm), dreaded agricultural pests, have shown that neurons responded very specifically to individual plant odors. These results correspond to the feeding habits of these insects: Both moths infest more than 100 different plant genera, among them many crop plants, and must therefore be able to accurately associate an odor with a particular plant species. In comparison, three specialist species, namely Acherontia atropos (death’s-head hawkmoth), Smerinthus ocellata (eyed hawkmoth), and Manduca sexta (tobacco hornworm), seem to have specialized in the recognition of only a few host plants: different odors often generated similar or even identical excitation patterns in the brains of the moths. Be the first to comment on "Odor Processing Function of Fly Resembles Mammalian Brain"